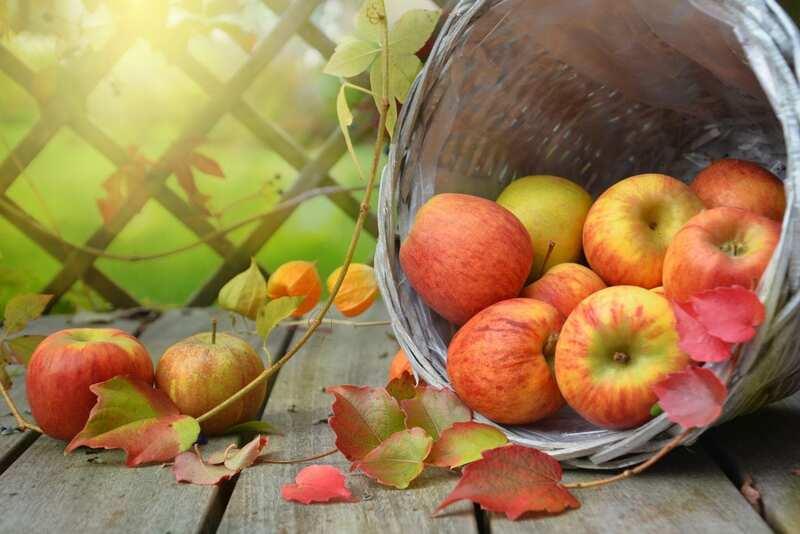 With summer still waving goodbye off in the distance, autumn is here and ready to delight with cooler days, crisper nights and a fall harvest that many of us excitedly anticipate all year long. It’s pumpkin season! Think of warm and vibrant spices like cinnamon, nutmeg, ginger, cardamom and cloves baked into roasted pumpkin, mashed pumpkin, pumpkin pie, pumpkin pancakes and pumpkin bread. Is your mouth watering too? Perhaps you’re not a pumpkin enthusiast. Let’s talk apples! Tart, sweet, crisp and juicy apples with just the right crunch. You know you’ve picked a good one when a light spray of apple juice caresses the cheek of the friend sitting across from you as you take your first bite. Green apples, red apples, yellow apples, or multicolored “rainbow” apples – as my daughter gleefully calls them. Homemade or jarred, unsweetened applesauce with a spritz of lemon and sprinkle of cinnamon is a quick, nourishing treat to prepare for children and grown-ups alike. 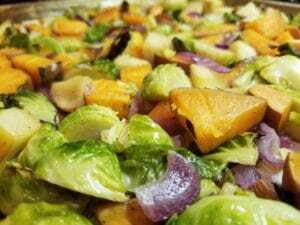 Then, of course, there is apple cider, apple pie, baked apples, dried apples, apple walnut salad or – I dare you to tickle your taste buds with this dish – balsamic-honey roasted apples, brussels sprouts and pepitas (recipe below). How are those seasonal salivary glands doing now? For those of us that hide-out indoors during the heat of the summer, autumn is a time to reconnect with nature. The colorful array of nutrient-packed fall produce that is available this time of year can cultivate any plate. 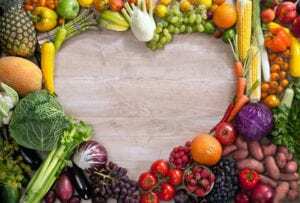 Fruits and vegetables contain vitamins, minerals, antioxidants and phytonutrients that nourish our bodies while helping to protect us from disease. When It comes to nutritional health, variety is vital as all foods offer different nutrients in varying amounts. Variety will also optimize gut health by establishing a balanced gut microbiome which can decrease risk of obesity, type 2 diabetes, depression, digestive disorders, and heart disease. A well-balanced plate is ½ fruits and vegetables, ¼ lean protein and ¼ whole grains. Select foods from every food group and produce of every color to incorporate throughout each day. Eat the rainbow for your health! Below is list of nourishing autumn harvest selections you might find at your local grocery store or farmers’ market. Never been to a farmers’ market? Now is the perfect time to go! The farmers’ market is a great place to meet community members and support local business. As a bonus, fresh-air shopping at the outdoor market provides a free source of vitamin D. Enjoy mingling with neighbors and soak up those warm sunrays while they last! If you don’t have access to fresh, seasonal produce, frozen produce is another great option because it is picked at peak ripeness, blanched and then frozen to preserve nutrients. In some cases, frozen produce may contain more nutrition than fresh produce that has spent days degrading in transit, on grocery store shelves and in your refrigerator. Choose plain frozen vegetables or fruit and flavor them at home with your preferred ingredients. Canned produce can also be a healthful addition to meals and snacks when choosing those that are sodium-free or low sodium and rinsing well before consuming. The key is to eat a variety of fruits and vegetables daily, whether they be seasonally fresh, frozen or canned. As 2018 transcribes its final chapters and fall leaves begin to color our sky, take a moment for yourself to appreciate the beauty of this season and harvest autumn while it lasts. Enjoy your nourished life.